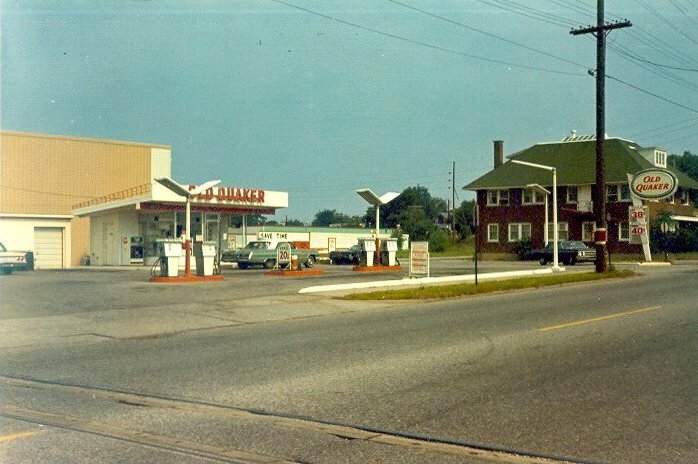 Here is an Old Quaker station photo. The station was in Grand Rapids, Michigan. Photo taken July 1, 1973 by Walt Wimer. I really know nothing about the brand/company as this is the only station of the brand I ever saw. I should have gone in and asked a couple of questions!! but I thought I would see more based on the branding with a plastic oval sign with "chase" lights!! Some 10-12 years ago on eBay there was some kind of give away from the brand, ice scraper? ?, key chain? ?...I can't really remember. Other than this station and that item on eBay I had never heard of the brand again until someone mentioned a station in Detroit. About what year was that?? I spent some time driving around in Detroit in 1959 and never saw such, but maybe the brand did not exist at that time. When I never saw another one, I sort of figured it was a one-off or a very small chain trying to copy the OLD DUTCH brand which marketed in western Michigan including the Grand Rapids area. They were a small refiner until the refinery burned, but a couple of jobbers kept the brand going at least well into the 1970s.